ILLUSTRATION: NOAH KROESE: Project Q Concepts! Here are some body sketches for one of the Project Q characters. Earlier versions of the face can be seen in a previous blog post. The clients thought the first set of faces were too realistic and asked me to give them more options. I'm glad they did. I think the new set of faces is far superior to the first. The possibilities for expression are greater and the character seems to have much more personality. They chose the version in the upper left corner. The body designs also turned out well. I haven't shown these to the clients yet, but I think they'll be well received. As you might have been able to ascertain, the character is a stoner (hence the accouterments). In the interest of COA, I will say we here at Kroese Illustration do not in any way condone the use or sale of illegal substances. 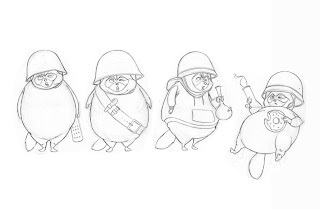 That aside (minus the fur and army helmet), this character looks a lot like some guys I went to college with. There was this one guy...er...I'll save that story for another post. Tell us the pot story! 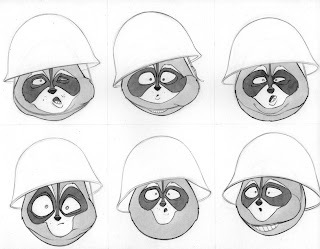 Seriously, though, Frank would lose it over these little raccoon faces. He has a thing. For raccoons.